However, it really wasn’t the best solution. 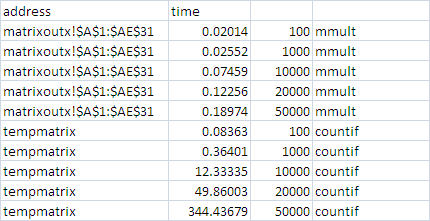 What would have been better would have been to use VBA to automate the creation of formulas, and optimize the formulas so that they would be viable with large data sets. This article will walkthrough the optimization excercise. this more or less entirely eliminates the setup time for the formula population, which was almost half the overall time – for the 50,000 test data set – 1500 seconds! Note that we have to make sure we have the $ syntax correct so that the fill operation increments for each cell. For more details on the sad() function,m see Formatting range addresses. 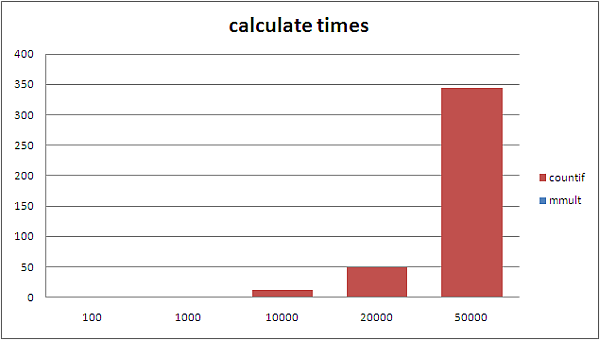 the data – elapsed time for calculation.